Looking for Chevy trucks for sale in Albany, NY? You have a bit of thinking to do. There are two different truck models that Chevy is known for: the Silverado, which has a legendary reputation for durability, and the Colorado. Which has recently gained fame since its release back in 2014, and has even won Motor Trend’s Truck of the Year award in 2015 AND 2016 for best-in-class fuel-efficiency and exceptional handling. Even though each truck shines for their own unique reasons, you still have to decide carefully. Because even though it might not seem like it, a full-size truck (Silverado) and midsize truck (Colorado) have some pretty staggering differences when it comes to performance, utility, and a few other attributes. But before we get into talking about some specifics, let’s take a look at what the difference between a full-size and mid-size truck is, and what that means for you behind the wheel. The obvious difference is one is a midsize truck, and the other is a full-size. Apart from differences in performance and utility (which we’ll get to later), the different sizes of each truck also impacts a few other attributes. First, it’s important to understand how trucks are measured. The U.S. government’s own truck classification system is based on the weight of the vehicle – GVWR (Gross Vehicle Weight Rating) for short. Therefore, trucks are divided into different classes based on their weights, which are ranked from 1 to 8 (smallest to largest). Since the GVWR refers to the maximum operating weight a truck can carry while driving — including the truck itself — it’s important to understand what the rating means for payload capacity, the technical term for how much a truck can carry. Beefed-up suspensions, or any other modifications are irrelevant — it’s all about the weight. That’s why you see those weigh stations on the side of the highway. They are designed for checking the larger trucks to ensure they aren’t carrying more than they should be. But, you don’t need to worry about those trucks. Your focus is the Colorado and Silverado. So, let’s take a look at what rank each truck matches. The Colorado is a midsize truck, and midsize trucks are typically ranked number one. Not because they’re superior to ranks 2-8, but because they are the lightest trucks on the road. A Class 1 vehicle is any vehicle that weighs 6,000 pounds or less. This includes midsize pickup trucks, small trucks, cargo vans, or SUVs. Since the most the 2016 Colorado weighs is 6,000 pounds (with all the additional features), it can’t quite break into Class 2. Class 2 is where the Silverado sits, and where full-size pickup trucks, larger cargo vans, larger minivans, and step vans fall into. These vehicles can weigh anywhere from 6,001 (they’re very specific) to 10,000 pounds. The weight of the full-size Silverado (the 1500 half-ton model) ranges from 6,500 pounds to 7,200 pounds, depending on what it is equipped with. It might not be on the larger side of that class, but it’s still well over the requirement for a Class 2 vehicle. Apart from the performance and general utility of these trucks (payload and utility), the Silverado and Colorado are also different in more ways than you may think. The Silverado is not just heavier than the Colorado, but it’s also longer and wider. That means if a crew or passenger cab is added to each one, the Silverado will naturally have more cabin space. It also means the Silverado is going to have a larger truck bed, and better stability, thanks to its increased wheelbase. But, that large wheelbase is a double-edged sword in a way, given that the Silverado has to take wider turns to make it into parking spots or around tight corners. The Colorado — which has less passenger and bed space — makes up for that with its nimble handling and a shorter turning radius. In terms of performance and utility, there are a few differences between these trucks’s ratings and equipment. Bigger engines necessarily equip the heavier Silverado, which means more raw power. But, the Colorado will experience naturally better fuel economy, simply because it’s a smaller truck with smaller engines inside it. And looking at the specs, that seems to be exactly the case. While the 2500 and 3500 Silverado models have an optional diesel engine, that isn’t the case for the Silverado 1500 — which has three different gas-powered engine choices: a 4.3-liter V6 (285 horsepower/304 lb-ft of torque), a 5.3-liter V8 (355 horsepower/383 lb-ft of torque), and a 6.2-liter V8 engine (420 horsepower/460 lb-ft of torque). The base trim gets 18 mpg city and 24 mpg highway, whereas the LTZ and High Country trims get 15 mpg city and 21 mpg highway. The Colorado also has three engine options, which are: a 2.5-liter four-cylinder (200 horsepower/191 lb-ft of torque), a 3.6-liter V6 (305 horsepower/269 lb-ft of torque), and a 2.8-liter four cylinder diesel engine (181 horsepower/369 lb-ft of torque). But, that diesel engine gets up to 22 mpg city and 31 mpg highway, which lands the Colorado best-in-class fuel economy of ANY pickup truck currently on the road. However, it suffers when it comes to towing and payload. Since the Colorado is smaller than the Chevy, it can only tow up to 7,700 pounds when properly equipped. While that’s best-in-class towing compared to other midsize trucks, the Silverado crushes it with a whomping 12,000-pound towing capacity when equipped with the 6.2-liter V8 engine. 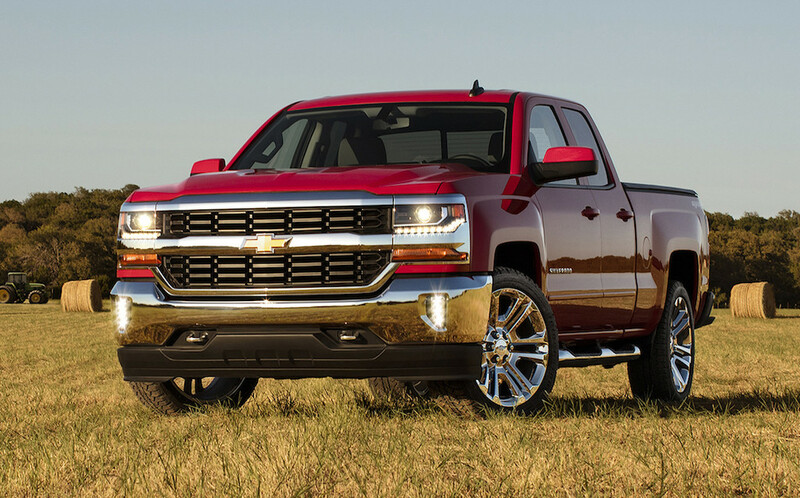 The 5.3-liter engine found on the Silverado gets an 11,000-pound towing capacity. With the 4.3-liter engine under the hood, it gets a 7,600-pound towing capacity, which is only 1,000 pounds less than the Colorado when powered by the diesel engine. When it comes down to it, deciding between the two trucks depends on if you want one that is better at towing and hauling heavy payloads, and has more power (the Silverado) or one that is more nimble with better fuel economy (the Colorado). Also, it depends on if you want a diesel engine or not, since the Colorado has one and the Silverado doesn’t. Keep in mind though, that diesel engine is going to cost more than just buying a base trim Silverado. Regardless of which one you want, each truck shines for its own unique reasons — and you won’t be disappointed with either choice.